Bryon and Martha Baba are proud parents of four outstanding children, three of whom presently march in Impulse. The fourth is going to be marching next year. Bryon recounts how he first came into contact with drum corps. "I saw the Kingsmen Drum & Bugle Corps warming up at the Hollywood Christmas Parade in 1971 when I was a snare drummer with a community college band. I was instantly hooked. "I still remember visually the breakdown of the drum line that I saw warming up: Ten snares, four tenors, four bass, five cymbals and five timpani. I decided then I needed to join a corps, but there were no corps in the San Fernando Valley, so I joined the Royal Cavaliers Youth Band from Van Nuys for the 1972-1973 season. The band did a similar tour as the corps did and hosted an annual drum corps show. "In our 1973 show, we featured a fairly new drum corps named Blue Devils. They surprised just about everyone by winning, because no one in southern California knew who they were. I went on to college and tried to go to as many shows as I could, but there were only one or two shows in southern California at the time. "Martha and I got married in June 1984, and one of the first things I did after we got married was take her to a drum and bugle corps show, the Odyssey Classic, at Cerritos College. She didn't understand it." According to Martha, "I couldn't tell who was better. I couldn't tell the Blue Devils apart from Santa Clara Vanguard. Their styles were different, but at the time, I couldn't appreciate the difference. But we ended up going back to the show every year." Byron states, "I wanted my two sons to be involved in drum corps, as I've always regretted not marching with a drum corps ... but I could never find one." Martha adds, "In 1999, by luck, I met an instructor from Impulse. We were involved with a winter drum line and ran into Louis Garcia, Impulse's soprano tech, at the drum line's Monday rehearsal." Bryon: "The following Sunday, we took our two boys, Byron, Jr. and Joseph, to an Impulse rehearsal, which at the time was 72 miles from where we lived. Immediately, they wanted to join, even though the corps was just forming. Our two sons were the two youngest members by far, 12 and 13 years old. "Joey could hardly lift the Baritone because he was only 12, but he survived and got his charter member patch, and two years later was the most-improved marcher. Sister Dana thought, "Oh my, this is so cool. I hope I get a chance to do it. I was kind of envious but I was supportive of my brothers and sister." Bryon: "Before Irene joined, the sisters would run onto the practice field after rehearsals and would pack up their brothers' gear. The brothers didn't mind." Dana: "Their friends referred to us as the slave sisters." Bryon: "Irene joined in 2003, and she was really dedicated because she was had been waiting a long time. She was Rookie of the Year. "One thing that gives us a big advantage is that since three of our kids are involved in drum corps and the fourth enjoys it, it makes it easier as parents to focus our attention, as the kids are going in one direction. "We now drive 55 miles to weekly rehearsals in Cerritos and we stay there for the entire day. Martha helps cook at the monthly weekend camps. "The activity has been very rewarding for us. 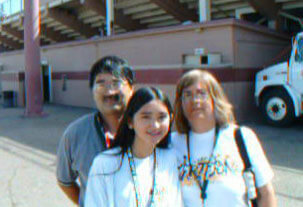 But 2004 is the first year I've ever gone to the DCI World Championships. We're all really excited to be here. It's more than exciting. I don't even know how to describe it. "Both boys are in college and we feel drum corps played a significant role in teaching them the discipline. Martha: "Drum corps and Impulse have taught our kids discipline—to stay focused, to complete their work, and to be self-dependent. We've worked as volunteers for the souvie vehicle since 2001, and we thoroughly enjoy it." Byron: "In 2002, at the Hollywood Christmas Parade, all four of our children marched brass with Impulse, Dana as a 12-year-old. The irony is that was the same parade that hooked me on drum corps." Dana: "At Yamato's home show in 2003, the booster president asked me if I wanted to carry the Impulse banner. Before the parade, members started cheering about 'The Baba Dynasty.' Today, whenever I see the staff, they ask me when I'm going to join, and I expect to play French Horn next year."